Depth of hold 34' 9"
Armament: One 5" and one 3" mount. 64k In port, prior to her World War I Navy service. Dictionary of American Naval Fighting Ships History: Veendijk (Id. No. 2515), a steamer constructed in 1914 by the Sunderland Shipbuilding Co. at Sunderland, England, for the Holland-America Steamship Line, was seized by United States customs officials at New York in March of 1918; turned over to the Navy on 28 March 1918; and commissioned at New York on 5 April 1918, Lt. Comdr. William S. P. Keyes, USNRF, in command. Assigned to the Naval Overseas Transportation Service, she was refitted for naval service at New York before embarking upon her first mission late in April. On the 17th, she departed New York with an Army cargo, bound for France. She arrived in Brest on 13 May but moved to La Pallice the following day. After unloading her cargo, the freighter departed La Pallice on 17 June in convoy for New York. She reached her destination on 2 July and began a repair period. She loaded more cargo and stood out of New York on 13 July, bound for St. Nazaire, France, where she arrived on 30 July. 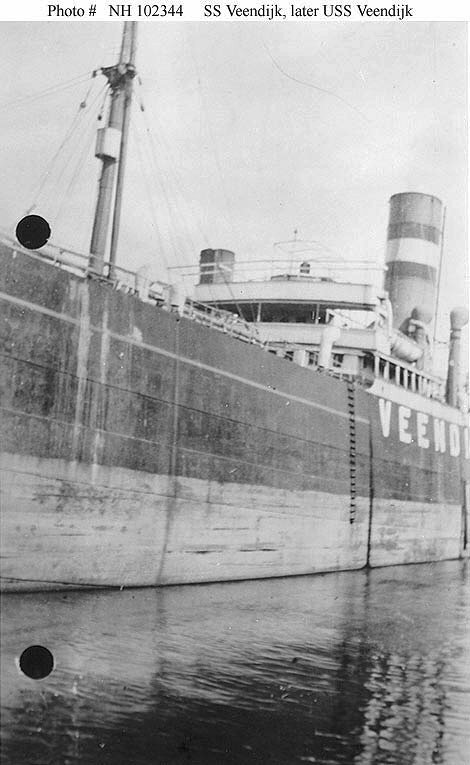 The cargo ship departed France on 21 August and arrived back in New York on 4 September During the remaining two months of the war, Veendijk made one more round-trip voyage to France and back. Following the armistice in November, she continued to serve the Navy. Between late November 1918 and late June 1919, the ship made another voyage to France and back as well as a round-trip voyage to Montevideo, Uruguay. 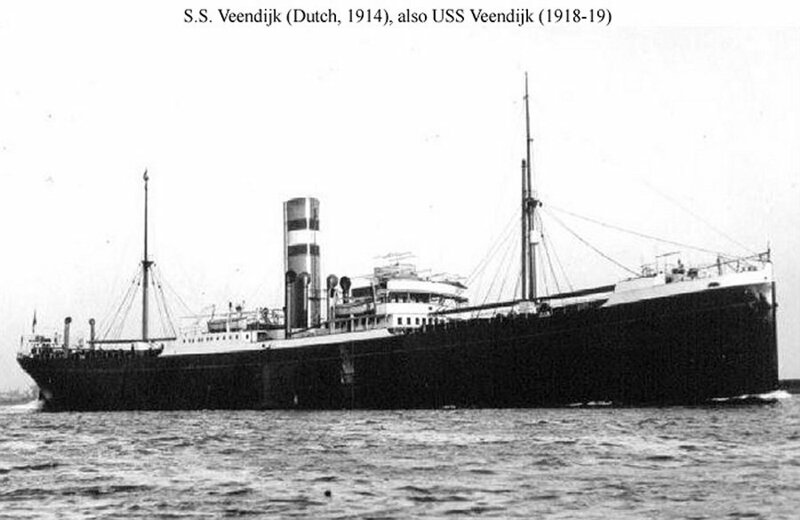 Upon her return to New York on 25 June 1919, Veendijk began preparations for going out of service. On 2 August 1919, she was placed out of commission at New York. On 21 August, her name was struck from the Navy list, and she was returned to the Holland-America Steamship Line. She resumed mercantile service with the Holland-America line until sometime in 1933, at which point her name disappeared from merchant ship registers.